Slickers® are vinyl covers made to fit an existing pad. This solution will either have a hook or loop fastener to attach to the table cradle, or will expose the hook or loop that exists on the pad. 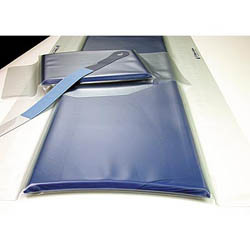 X-ray Angio Slicker Cover for GE Omega IV Tables; fits 3" & 4" thick pad 118" 8" 17 / 26"
X-ray Angio/Cardiac Slicker Cover for GE Omega V Tables; fits 3" & 4" thick pad 132" 8" 17 / 26"
Angio Slicker - GE Omega IV Tables (118 in. ); fits 1" & 2" thick pad 118'' 8'' 17 / 26"
Angio/Cardiac Slicker - GE Omega V Tables (132 in. ); fits 1" & 2" thick pad fits pad E8015JB 1" thick 132'' 8'' 17 / 26"
CT Slicker w/ Extender - 9800/HiLight Advantage Systems w/o Metal-Free Head Holder 75" 16"
Slicker Cover for Toshiba Aquilion Prime 96½" Table Pad 96-/2'' 19"
Slicker cover for Philips and Neusoft, 2100mm x 440mm x 20mm, 170mm flap 82-5/8" 17-1/4" 3/4"